In a large, deep skillet, heat the oil, three turns of the pan, over medium-high. Season the chicken with salt and pepper, add to the skillet and cook, stirring occasionally, until browned, about five minutes. Transfer the chicken to a plate. And the onion, celery, garlic, crushed red pepper and fennel seed to the skillet and cook, stirring often, until the onion softens, about five minutes. Add the tomato paste and stir until fragrant, about two minutes. At the wine and stir until evaporated, about two minutes. Add the tomatoes, crushing them with your hands, then the olives, stock and capers. Add the kale, stir to wilt, then add the chicken and its juices. Simmer, stirring occasionally, until the chicken is cooked through, 8-10 minutes. Season and serve with the crusty bread. In Recipes-list.com we have selected the most viewed recipes from category - uncategorized . Enjoy the best recipes specially selected for you! 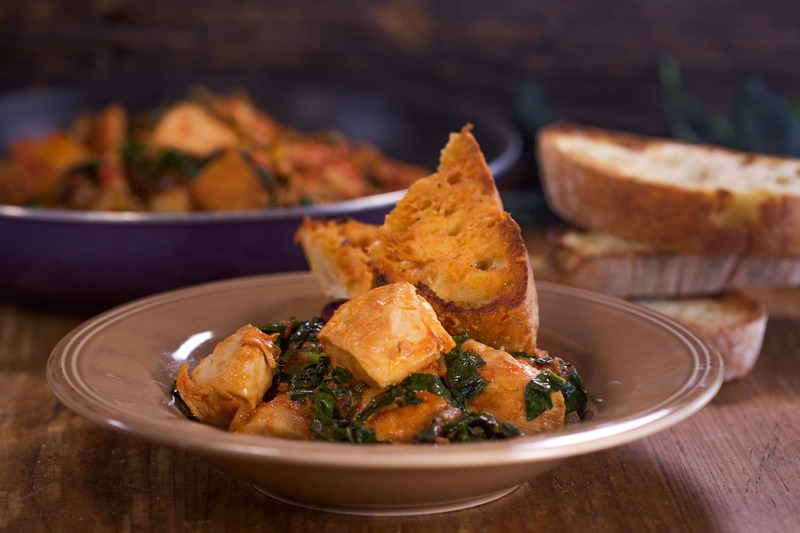 Chicken with Olives, Capers & Kale is the right choice that will satisfy all your claims.